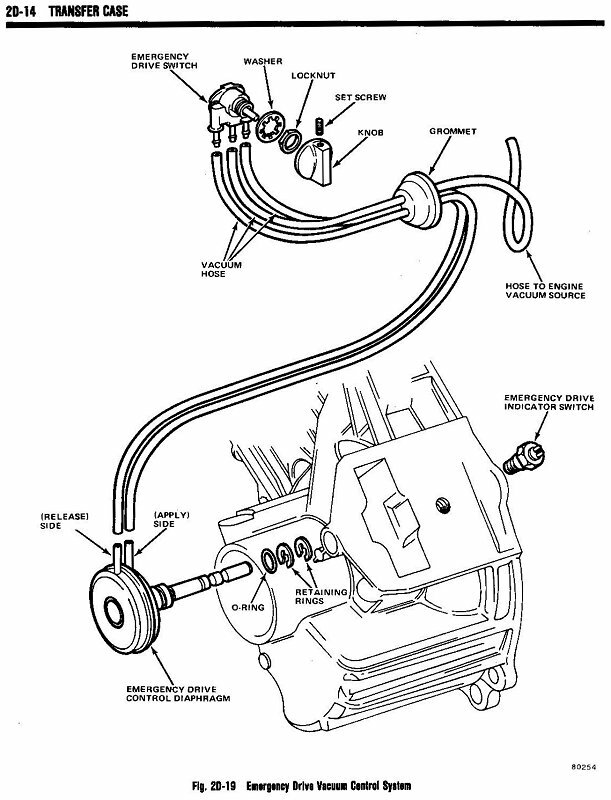 Hi, I'm in need of a diagram for the vacuum lines from manifold to the transfer case on a '74 J-10. The lines were all mushy and would like to temporarily switch to the thin, hard plastic lines from a donor vehicle. And is there a vacuum switch from the intake mani or is it under the dash? Hi, rockosocko (Errol)! You've got a vintage J-truck/FSJ with the Warner Quadra-Trac 4WD chain drive transfer case. Look in the glove box for the vacuum switch. Follow the hose routing from there to the transfer case. Note that this is the "emergency" control circuit. Quadra-Trac in stock form is full-time 4x4. There are aftermarket conversion kits like the Mile Marker that have turned these transfer cases into "part-time" 4x4 for use with free-wheeling front wheel hub lockouts. Do you have free-wheeling front wheel hubs? If so, you likely have a part-time 4x4 "kit" installed here. If not, the system is stock full-time 4x4, and the vacuum circuit is an emergency override. Hhmm...I remember reading that it was to "Lock the transfer case IN". So I thought that it sort of 'free-wheeled' until that lever was pulled/vacuum was applied. Thank you for your time to post it for me. Are you sure there aren't 4-5 of you? I googled you and man, how do you have the time to help everyone else? Did you ever think of compiling a book of photo's of your journeys? Any-who, when I was under there observing, there were two pretty spongy lines just hanging there. I would think any vacuum over a 3-4" length would collapse it. SO, 'Master Mechanic me' ripped it off and tossed it. It's pretty spartan under there anyway, so I was looking for some hard line to replicate. Going to a 2wd th400. I don't "need" 4wd for my desires of it's intended job(s). Phasing is still phasing.. It's all in a circle. Just as long as the two mating surfaces remain parallel, it (in theory) will work. For those who jumped forward to start typing...If you would like to pay the fuel cost, I'd be happy to take donations. If you're doing a THM400, I would simply eliminate the existing transfer case and build your THM400 into a 2WD version with a passenger car or 2WD truck output shaft and tail housing. The scarce commodity here is the AMC V-8 interface at the front of the transmission case. You're creative and can work around this issue. There's no point in having parasitic loss with a side-drive (chain) transfer case that serves no purpose in a 2WD vehicle. There is one other issue, however. In order to use a straight through output from the THM400 transmission, your J-truck rear axle must have the centered differential. The Jeep CJ models with Warner Quadra-Trac have an offset rear differential. Which type rear axle do you have here? I wanted to ask that question but didn't want to get flamed by "know-it-alls"
The way i see it is (and have read it several times) that just as long as the two flanges are parallel or in phase that you're good to go. Otherwise, I planned on doing the RWD 400 'rebuild' last year since I have a couple 400's built already. Its' just that they're GM. I have one from a motor home that's got the rear E-brake and wanted to swap the heavy duty parts to the AMC case. Then, I'm reading through the classifieds and almost fainted when i see someone selling a AMC V8- GM th400 adapter. WOOHOO! I should have it by Monday!! The dream is getting closer. I have a 200r4 and a cable 700r4 that are rebuilt also! I might just sleep good tonight. Scarce commodity? You'd think that someone would've cast a run of them. Couldn't be THAT hard to reproduce.. Unless the quadra-trac isn't that 'loved' by the community. Errol...The J-trucks have a longer wheelbase, which decreases the U-joint operating angles at the rear driveline. This enables the rear axle to have a centered differential despite the offset output from the Quadra-Trac transfer case. You're right, the drop and side offset (think plane and side views) is still within tolerance as long as the U-joint angles are not excessive (which reduces torque capacity) and the angles cancel each other as far as phase goes. Again, the longer wheelbase makes this possible. On the CJ-7 Jeep at a 94" wheelbase, the rear differential had to line up with the offset output of the Quadra-Trac to help reduce angles at the U-joints. Simple. Compound though it seems, you're correct in noting that it's simply about cancelling the angles of the joints. The flanges are parallel (plane view), and combined side shift and drop is immaterial to the U-joints as long as their rotational arcs are identical and their angles cancel each other. If so, they are in phase. Moses, Again thanks for taking time out to respond. My back is a little sore this past week or so, so that I think I'll wait 'til after the 4th weekend to evaluate. AND, I think I should search for threads on converting to 2wd (as stated above) THEN, making a thread dedicated toward my endeavor of accomplishment. That way when peeps search, it would be easier to find.